My daughter had friends over for a playdate a few days ago. "What do you want to do?" I asked them. "Draw pictures, play games, play outside?" The answer was unanimous. 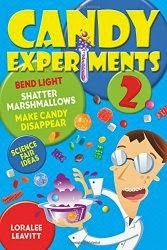 "Candy experiments!" So they experimented for 45 minutes. Didn't even eat the candy. The only drawback? A very sticky table.